While aspiring decorators may get sticker shock looking at big-ticket items like sofas and dining tables online, take heart: There are plenty of ways to give your space a grown-up makeover without dropping a lot of cash. And those pricey items? We’ve got some tricks for those, too. 1. GET CLEVER WITH SOURCING. Yes, that sleek sofa is pricey — but it may be cheaper elsewhere. There are plenty of well-established furniture listings online and in the paper to look through, but don’t forget new-media options. Design blogs often have their own classified sections, and social media sites often feature plenty of local garage and estate sale groups. 2. DECIDE HUE YOU ARE. Getting a coherent color scheme is one of the fastest ways to make a place look put-together. If crafting a color scheme sounds intimidating, make it easy on yourself. Go neutral for big pieces of furniture. 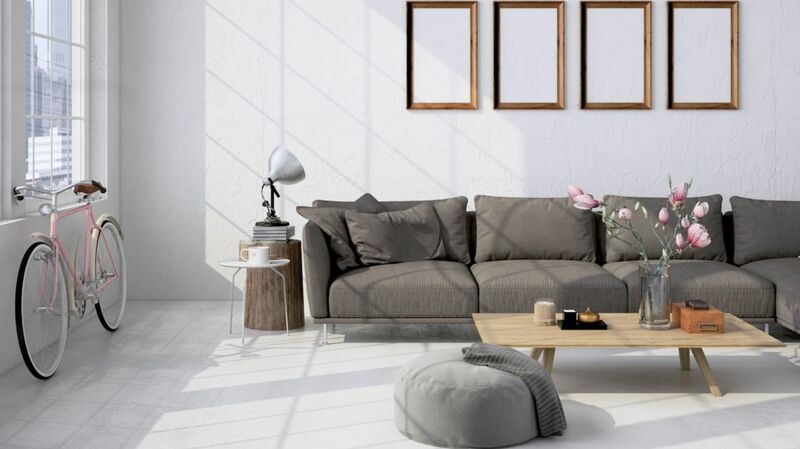 It looks sophisticated, and a light gray couch will grow with you so much better than a bright pink one (even if it looks oh-so-cute right now). Bored by beige? Try black and white, and pick an accent color for pillows, plates, napkins, tchotchkes, doodads, and the like. And don’t forget, you can pick different shades and intensities within that tone. Bringing in a few ferns, ivy plants, or succulents is the fastest and cheapest way to elevate a space — and it shows guests you can care for a living thing! (Just set a calendar alert to remind you to water them.) If you’re feeling fancy, try a fig tree. When’s the last time you went to a real home and it didn’t have towels in the bathroom? Or window treatments? Or accent pillows and throws? Exactly. Add warm and cozy details liberally — and don’t forget that matching sets work best in a bathroom and on windows. Repeat after us: I will not use tape and tacks on my walls. I will not use tape and tacks on my walls. Yes, this is the cardinal rule of post-collegiate living, but the principle extends: Pay attention to the little touches and flourishes. Change out hardware on your generic furniture for thrift shop knobs or pretty pulls. Stack a lovely pile of books you already own on an end table. Keep pillows fluffed, or at least upright. And for those beloved prints or posters you just can’t toss, get them framed. Even better, buy a few matching frames and make a wall grouping. Of course a space should be clean in general — there’s nothing like dirty dishes piled in a sink or toothpaste spots on the bathroom mirror to kill the adult vibe — but keeping surfaces clear automatically ups the ante. Remember: Minimalism never goes out of style, as long as it’s intentional. 7. DON’T TRY TO ONE-STOP SHOP. Above all, don’t go to just one store to buy everything. Putting together any space takes time — and that’s doubly true when you’re on a budget. Live in your space for a bit before you fill it, even if that means you’re end table-less for a while. Making a space look intentional, no matter what your intentions might be, will always make a home look more luxe. Whether you’re buying a new picture frame or swapping out that futon, Discover it makes it easy to earn cash back on all your apartment-shopping purchases. In fact, they’ll match all the cash back you earn, dollar for dollar, at the end of your first year. See Cashback Match terms. Visit Discover to learn more.